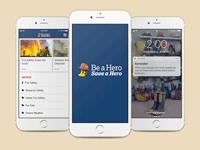 Be a Hero, Save a Hero® is the community risk reduction program of the National Fallen Firefighters Foundation. The goal of the program is to encourage the public to be pro-active in fire safety by raising awareness and increasing knowledge of smoke alarms, fire sprinklers and other general fire safety practices. Easily customized special alerts and notifications including reminders to check and change your smoke alarms, weather safety resources and more.